This paper investigates the integration of the technology mining and the technology delivery system. It looks at the various types of technology mining and matches sources and methods to various points of the delivery system. It presents a model of technology mining that brings together the Technology Delivery System and incorporates the life cycle of enabling technologies. The Technology Delivery System (TDS) was introduced in a paper by Wenk and Kuehn in 1977. It describes the development of a technology as a system that extends beyond the technological aspects but to the institutional and social systems that impact the delivery of the technology. It helps to put a focus around scanning and learning activities, specifically toward activities that will contribute to the successful development and deployment of a technology. 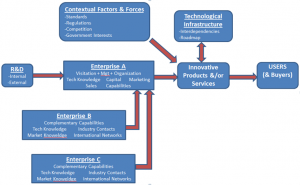 This model maps the factors that factors that most contribute to that development including the social, political, competitive, and of course technological factors. The TDS has four basic elements. 1. Inputs to the system, including capital, natural resources, manpower, tools, knowledge from the basic and applied research and human values. 4. System Outcomes, including both the intended and unintended effects on the social and physical environment. This report will propose particular scanning activities and sources, matching technology mining indicators to particular aspects of the Technology Delivery System. Such a presentation framework can provide critical information to a manager in identifying gaps and inconsistencies in the information available. Thus, answering additional questions, such as does the R&D match the enterprises involved.